What makes a community? How can we turn back the clock to unlock the future? What scares you? 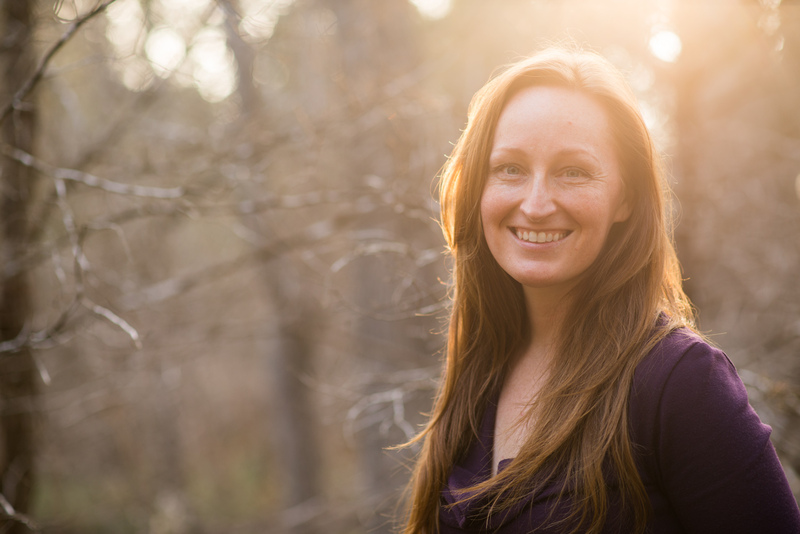 Dawn Youngs takes a moment away from casting; venue and travel arrangements; and publicity to answer a few questions about bringing Last Chance: tales from a broken heartland to Austin, Texas as part of Spooky Action Ranch’s Nurturing New Ideas Series. Artistic Director Dawn Youngs out on the land at Spooky Action Ranch. Image by Will Hollis Photography. 1) Why bring plays about the Ozark Mountains to Austin? Well, first off, I am not sure that I would describe these plays as plays about the Ozarks. They take place in a fictional town in the Ozark region, and there is no doubt that there are themes running through the plays that get at the root of that rural American life, but I also think these are universal themes that run through the lives of people around the country. Most of all, I think these are plays about community and interconnection, and the struggle to find a place for self or to define self. Austin is a booming town, but part of what that means is that the unique community and small town feel of the place has been rapidly consumed by the rabid growth. Individual neighborhoods, and I think the city as a whole, are grappling with issues of identity. Struggling with how to maintain the older connected ways of life while money and technology flood in. There is a clash between the folks working to keep Austin weird, the trailer parks and honky-tonks, and chicken coops and urban farms of Austin are clashing with the condos and developers. And on a broader sweep, this is happening all over. My generation, raised in the 70s and 80s were raised as little consumers: pushed to believe that constant growth and consumption was not only necessary for the success of our nation, but also really good for us. I see people questioning this idea all around me. I think they are waking up to the lies and wondering, what are all of these material goods really worth? What do we lose when we become one huge homogenized consumer culture? These plays tap into that awareness and I think that Austinites are ripe for exploring these ideas. In fact, I think they are poised to be the leaders in a new movement and shift in American values. Austin is not only ready to hear the questions raised by this work, but ready to grapple and search for real answers too. 2) What form do you imagine this series of plays or this project taking? Many of the plays have extremely different tones and settings, how do you navigate that? There are a lot of ideas floating around in my head on this one, but I think they all are linked and related. I know that we call this the great recession, but that’s just a silly idea made up by the media corporations to put a safe term on whatever it is that is happen to the nation economically. I think the reality is that we are facing a whole new paradigm. The twentieth century was something amazing, but it wasn’t sustainable or even necessarily particularly beneficial for humans as a race or the planet as a whole. On one hand, I see our country trying to push forward on the trajectory established by the last century and on the other I see the foundations of that system crumbling all over the place. 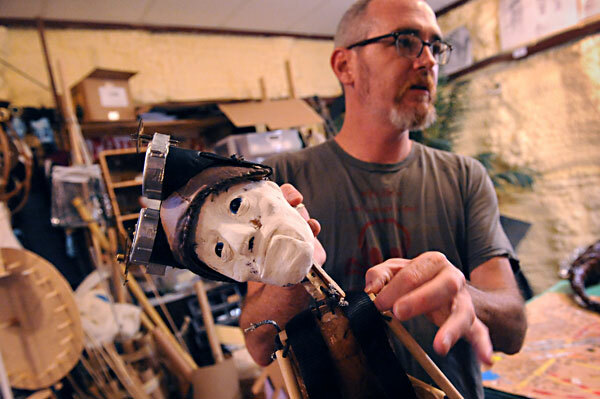 Connor Hopkins working on The Mechanic for the Trouble Puppet 2013 production The Head. I think that these works are theater for the people and so I want to find a way to bring this work to them. I want to tap into theater traditions that predate the golden age of the regional theater. I would like to draw from Brecht and Commedia and Shakespeare to blend them with the modern internet serial and binge watching and our ever interconnected new world. There are a lot of different settings and moods in these plays, but I trust in the power of the performer to bring those details to life. I think that the full company of players will be needed to make each play happen. That place becomes a character too. In this I am inspired by the work of Connor Hopkins and his company Trouble Puppet, it is a style or way of working that is found throughout his pieces: the construction of a mechanical set that functions, through the work of the performers, as a living entity in the plays. I can imagine such a set that can act upon the characters and itself morph as the series unravels before us. 3) What is the most terrific/terrifying thing to you about a project this ambitious/complex? I think that a work this large really requires a community to accomplish it. There is no way that any one man or woman can make this thing happen through their own will or determination. The prospect of building that community and having the troupe, the family, the company of players that comes together to make something greater than themselves is the most terrific aspect of the project. That collaboration and exploration in this manner leads to wondrous places that I personally would not or could not have travelled alone. If I could step back in time, I would want to step back to a time when a theater troupe lived and worked together. It was family, it was the community. I see the potential, in this work, to step that idea into the future. On the flip side of that, I find the challenge of community terrifying as well. Not only must I allow myself to be vulnerable, to trust in and rely upon others for my own success. I must also be trust worthy and reliable. I must live up to the expectations of my partners or even exceed them. I might be let down, if I trust in others. I might let someone else down if I let them trust me. Both sides of that coin give me ripples of anxiety in my belly and I breathe through them and tell myself to let go. Facing that fear is the most terrifying aspect of this project, but the possible result of it, coming closer to other people, sharing ideas, exploring who we are as humans, just the prospect of that is terrific. 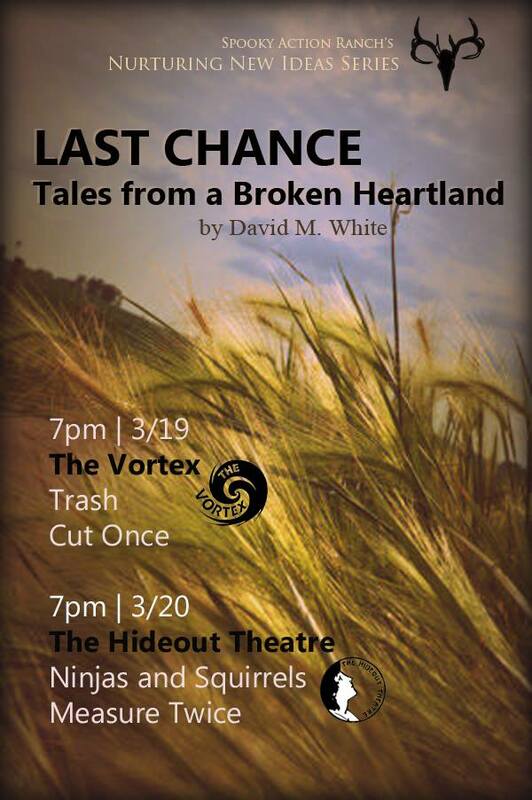 The Last Chance – Tales from a Broken Heartland readings will occur on March 19th at The Vortex Theater and March 20th at the Hideout Theatre in Austin Texas. Readings will be free and open to the public, with talkbacks and discussions following the readings. You can find out more information about the Spooky Action Ranch Nurturing New Ideas Series on our facebook page.